Quietly munching on tamales and sipping horchata in a hushed McCormick Lounge, the attendees of last night’s Mural Magazine release party clung to every syllable of poet Claudia Garibaldi’s thick Spanish timbre. Grad student Carly Offidani-Bertrand, another Mural contributor, followed Garibaldi’s reading with a recitation of her own Tacto, a longer work of prose. This fourth and newest installment of UChicago’s bilingual literary magazine, which achieved RSO status in fall 2015, features twelve pieces sorted into five categories: staff reviews (reseñas), poetry (poesía), open opinions (tertulia), politics (política), and creative prose (prosa creativa). Works of visual art (arte visual)—mostly full-color photographs by undergraduates Paula Carcamo, Regina Favela, Christian Sanchez, and Ada Torres—are scattered throughout the magazine. Torres, a fourth-year history and Latin American studies double major from San Juan, Puerto Rico, founded Mural as a second-year. While studying in Barcelona, Torres realized how much she missed writing in Spanish, and so she began to coordinate an RSO from abroad. Torres recruited romance languages and literatures associate professor Agnes Lugo-Ortiz as Mural’s faculty advisor and developed both a website and Facebook platform. “I really like film, so I’m trying to study screenwriting. But definitely literature and the region of Latin America is my specialization. So founding Mural has made me realize that I’m interested in editorial work,” Torres said. In addition to the department of romance languages and literatures, Mural now also receives support and funding from campus organizations like the Center for Identity and Inclusion, the Center for Latin American Studies, and the Center for Mexican Studies. 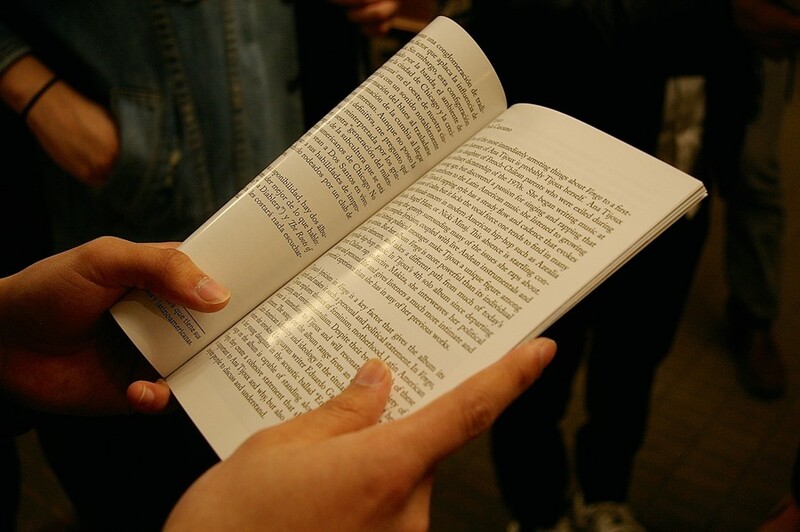 These groups, along with the Dean’s Fund for Student Life, assisted Mural in producing 125 copies of the small five-by-eight-inches magazine—25 copies more than ever before. Each edition of Mural centers on a theme. While past quarters focused on topics like “The Latin American Boom” and “The Avant-Garde in 1920s Mexico,” Invierno 2016 addresses music as it features in movies and television as well as critical reviews. In her short Spanish essay Gueros (soon to be translated into English), Torres explores the role of music in this 2015 film. In Vengo, second-year Paula Carcamo discusses the importance of hip-hop artist Ana Tijoux to the child of French-Chilean parents. Jasmin Pizano’s La Banda, however, takes a more contemplative approach, reflecting on the fine line between musical art and entertainment. Unlike past editions, this winter issue showcases a cleaner layout complete with full and two-page photo spreads, marking Mural’s transition from an anthology of academic papers and book reviews to a more artistic compilation of prose. “I want to get to a point where, each year, there’s a zine edition of Mural—with the text more sporadic and more visual art,” Torres said. As Mural continues to grow within its niche, members also hope to explore outside projects. This spring, Mural staff will design the program for the Organization of Latin American Students (OLAS) cultural show. According to Torres, this program will be a chance for the design team to try out the zine format. As the food from Little Village’s Malolos Tomales dwindled and Offidani-Bertrand closed her piece, Torres started up a YouTube playlist of songs mentioned in the issue. Family and friends mingled, read, and danced for the rest of the night, chatting away in both English and Spanish. 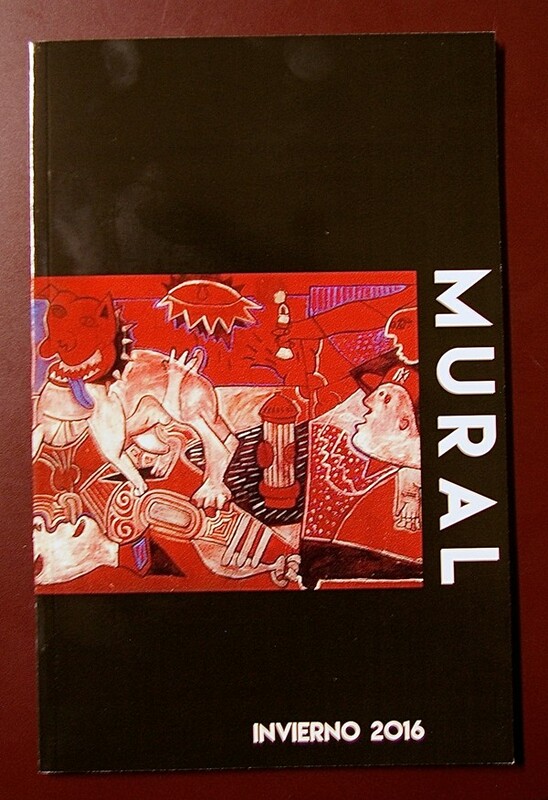 Copies of Mural can be found in Hallowed Grounds, Harper Café, and Cobb Coffee Shop. Find it online at muralmagazine.squarespace.com.